The images in this collection are scanned from an account book kept by the Coppock sisters of 'The Alders', a large house in The Crescent, Davenport, Stockport, from 1899 to February 1917, after which there are no more entries, although the book itself, made, according to the inside cover, by 'King, Account Book Manufacturer, Stockport' has many more pages, all empty. The book was found in Falmouth, Cornwall, in the collection of Jean Sylvia Potter, who was originally from East Anglia. With it was a piece of paper reading 'Fred Waite, Head Gardner [sic] at Sandringham House. A great uncle to our dad.' We know nothing more about its history after 1917. The entries themselves are a facinating insight into life in Edwardian England. We have scanned each of the 50 pages individually, and given each its own webpage so that we can add notes as time goes by. The links on each page allow any page to be selected as required. You can also download the whole book without the annotations) as a 12 MB PDF file. Note that we have in many cases omitted the headings from the top of the pages, which are foolscap (8.5 x 13.5 inches) in size, for ease of scanning. Reading the entries, it becomes clear that they do nor tell the full story: Census records tells us that the household of the Misses Coppock includes a housemaid and a cook, but there is hardly any mention of them and no sign of their wages, which may have been paid directly from Henry Coppock's estate. In 1901 the cook was Sarah Hayward, age 45, daughter of George Hayward, a market gardener in Heaton Norris, just north of Stockport, and housemaid was Ada Haddock, age 20, daughter of a railway porter from Crowton, Cheshire. In 1911 the cook was Lavinia Mayer [spelled 'Meyer' by Bertha Coppock when completing the 1911 census] (34), daughter of a coal miner, Elisha Mayer, of Audley, Staffordshire, and the housemaid Lettice Johnson (22), daughter of a forgeman from Biddulph in Staffordshire. Reading the account book, and knowing that the two servants, helped by coachman Mr Dishman and local tradesmen, did most if not all of the domestic chores, we are left trying to imagine how the four sisters passed their time if those far-off, yet in a way modern, Edwardian days. Gardening, playing the piano, reading newspapers, and eating, along with entering horticultural competitions, and charity work can be deduced from the entries. Their horse-drawn carriages would no doubt have taken them to visit their friends and relatives. 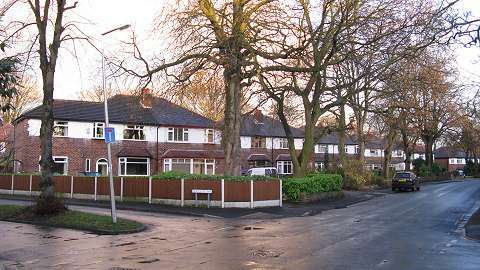 The Crescent, sometimes called Davenport Crescent, was laid out by The Freeholders Company, a Manchester firm of property speculators, on part of the meadows and pasture of Mile End Farm, also known as Simpson's Farm, which at the time of the 1840s tithe maps had occupied most of the land bounded by Kennerley Road, Bramhall Lane, and the Stockport - Buxton turnpike (now the A6), and was part of the township of Bramhall until the 1901 boundary changes. 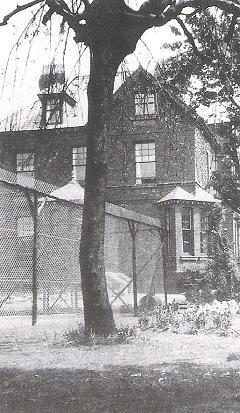 The farm buildings lay alongside the Buxton road, close to what became entrance gateway to the Davenport Park private estate; in 1841 the tenant was Isaac Cheetham. The Freeholders Company purchased the part of the farm south of the railway line, along with Bramall Hall itself and much of its other land, in 1877 from the last of the Davenports of Bramall, John William Handley Davenport, who was leaving his ancestral home to move to an estate inherited through his mother's family in Rutland. 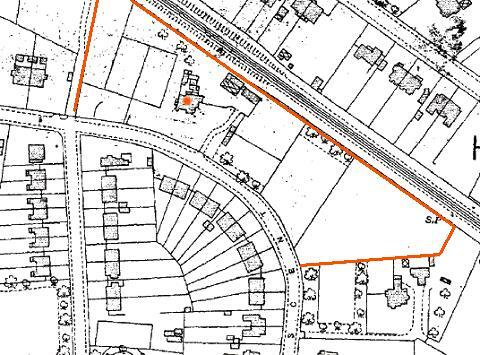 The company envisaged it as an exclusive private estate, and offered plots of land for sale, but take-up of these plots was very slow; several were still unsold by the 1920s, and eventually the land came to be filled by a mixture of smaller houses and large mansions. A number of the large ones, including 'The Alders', have since been demolished to make way for more practical residences. A large plot, bounded by The Crescent and the Stockport - Buxton railway, was sold in 1885 to James Chetham Kenyon, born in Stockport in 1836, a steel merchant, who had a house built which he named 'The Alders.' The house is marked in red on the map above, which dates from c.1910. The area lies on the border between two map sheets, which is why the railway line and streets do not quite line up. 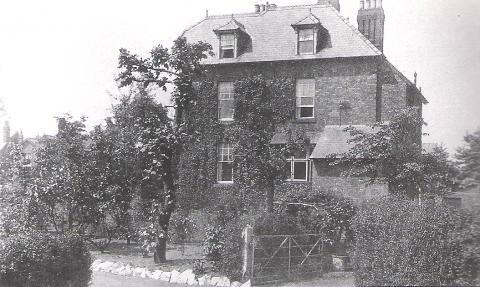 By 1891 Kenyon was living there with his wife Emily (aged 45) and their six children, having moved from their previous home at 2 Adswood Crescent. He appears to have retired to Wales on leaving 'The Alders', as his death was registered in Conway in 1897; in 1901 his children, Harold (now aged 31), Bernard, Gerald, Hilda, Hubert and Emily, were to be found back in Stockport, sharing a house at 190 Wellington Road North in Heaton Norris. For the story of the family who kept the account book, we must go back in time to 1835, when the Borough of Stockport was created, with many others around England, by the Municipal Boroughs Act. Appointed as Town Clerk to the Borough Council, roughly equivalent to today's Chief Executive, was Henry Coppock (Pictured left) a Stockport-born lawyer. Henry, born in 1806, who lived at Daw Bank House, served the town through troubled times of strikes and Chartist riots, but, found the time to father Henry William Coppock (1843 – 1844), Ann Bancroft Coppock (1845 – 1900), Oliver (1846 – 1928), Matilda (1848 – 1931), Nora (1849 – 1851), Russell (1851 – 1923), Sydney (1853 – 1908), Bertha (1854 – 1918), Henrietta (1856 – 1928), Theodore (1858 – 1890), Beatrice (1860 – 1934), Mabel (1863 – 1937). Henry Coppock died in 1870, and his wife, also called Ann Bancroft Coppock, died in 1899. It was no doubt the death of their mother that prompted unmarried sisters Bertha, Henrietta, Beatrice and Mabel to set up home in 'The Alders' which was probably standing empty by 1899. No doubt their elder brother Oliver, who had followed in his father's footsteps and become a solicitor, assisted them with the purchase. He lived with his family not far away in Heath Road, Cale Green. 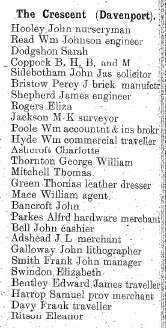 Russell Coppock also became a solicitor, and also lived in Davenport by 1901, at 'Moorside' in Davenport Park. Theodore Coppock studied law and became a barrister, being called to the Bar in 1884; he drowned in the Hardanger Fjord in in Norway in August 1890 while on a fishing holiday with friends. Sydney Coppock became a paper manufacturer and left the Stockport area: he lived at Upton, near Macclesfield. In fact Bertha had died early in 1918, perhaps after a long illness. In 1920 the registered voter at 'The Alders' - no. 9 The Crescent - was Alfred Rowland Davis. There was a London-based engineer of that name - perhaps he stayed in Stockport for a while to install some machinery. 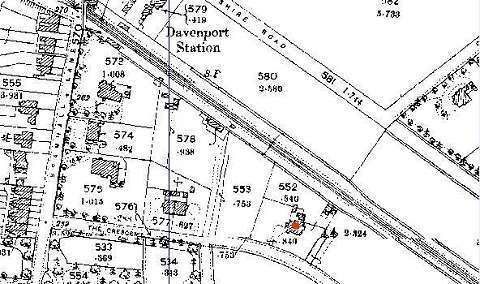 Later directories show that the remaining Coppocks had left 'The Alders' for a smaller house: 'Beechfield', 14 Clifton Park Road, on the other side of the railway line Davenport Park. The next occupier of the house, listed in the 1921 Register of Electors, was Frank Stafford Johnson, a textile mill owner who renamed it 'The Paddocks.' He married Sarah Alice Pickford in 1901 (she died in 1919) and they had four children: Frank Stafford Johnson [Jr], his twin Hilda Marian Johnson, Ruth Stafford Johnson, and John Goode Brady Johnson. He was a son of John Goode Johnson, of Brinnington House, owner of a calico bleaching works. Frank was a keen sportsman: as well as being a member of Stockport Cricket Club and Davenport Golf Club, he excelled at Lacrosse, and was a member of the Great Britain team which won the silver medal at the 1908 London Olympic Games by not beating Canada, the only other team in the competition. His brother Lewis Brady Johnson, manager of the bleachworks and also a lacrosse player, moved into another house on The Crescent, No. 37 'Oberhofen', around the same time. See separate article. Frank Stafford Johnson [senior] died in 1950. Frank Stafford Johnson junior, who by 1939 was living at 302 Bramhall Lane South, and appears to have used Stafford as his preferred first name, and lived until 1974, latterly at a house named 'Brynnington' on Broadway, Bramhall.. Hilda Marian Johnson married James Gibson in 1928, and died in 1995 in Aberconwy, North Wales. Ruth Stafford Johnson married Robert S. Barringer in 1928, and died in 1979, also in North Wales. John Goode Brady Johnson died in 1966. The Johnson family is extremely well documented online, both on Ancestry.co.uk and the Stockport Libraries image database. Care is needed in following their story, as the same full names were re-used through the generations. The 1960s map above shows the layout as it still exists in 2012. 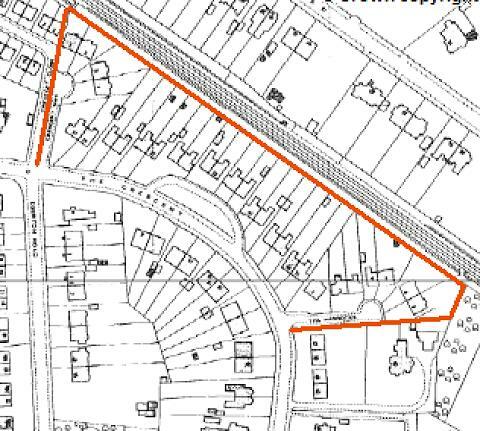 The historic differences in land ownership, and development at different times, explain the curious arrangement of parallel streets, Crescent Way and Crescent Close, on the western side. Altogether there are now 29 homes on the site and grounds of 'The Alders.' The building of all these new houses necessitated a complete renumbering scheme. 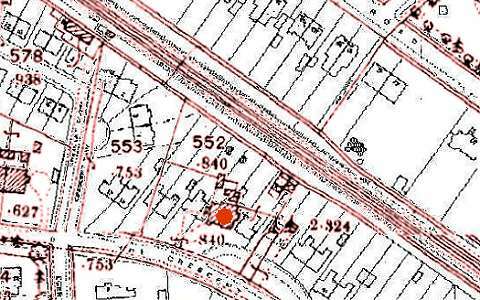 Overlaying the 1910 map (red lines) on a modern map reveals that the site of the house was somewhere to the left of the parked car in our picture above. The two large semi-detached houses on the left edge of the map are the only buildings from the old map still surviving in 2009. A recent aerial view of the area shows that there is no trace of 'The Alders' ever having existed. The picture of 'The Alders' at the head of the page is one of a number included uncredited) in the book Images of England: Stockport compiled by Morris Garratt and Shirley McKenna (Tempus Publishing, 1999). The authors state that Frank Stafford Johnson moved in 'around 1900' which appears to be inaccurate. If you have any information about the house or the Coppock family, or have any opinions regarding copyright, please do get in touch. The Coppocks were regular customers of Ellis Sykes & Son, a company which lasted until the late twentieth century and will be well remembered by many Stockport residents. This advertisment is from 1902. Written by Charlie Hulme 2009. Updated November 2012.